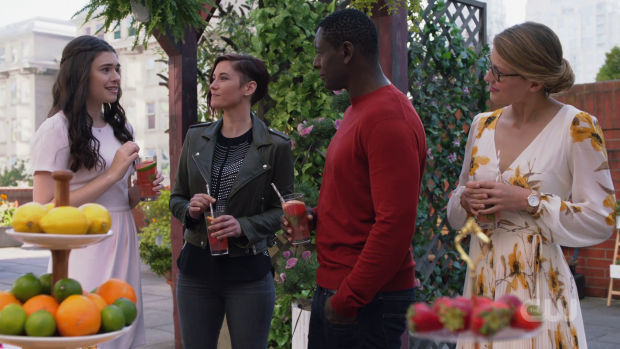 Supergirl continues to develop the anti-alien plot through James being branded a symbol of the movement as Kara discovers that she should look beneath the surface before coming to conclusions. Of all the plots vying for attention this week, Kara’s was by far the weakest. I’ve repeatedly mentioned that Supergirl needs to find a neater way to utilise Kara’s double life which means creating stronger and more meaningful journalist plots. At the very least this is an attempt to do that but the actual execution of this is really clumsy. 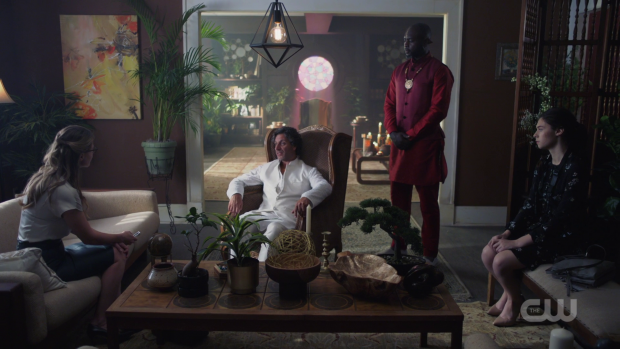 The setup is that Kara has managed to bag an interview with Amadei (Adam Levy); an alien healer who hasn’t consented to an interview in over 20 years. What follows is an article written by Kara praising Amadei as if he’s some sort of saint fully dedicated to using his gifts for the benefit of others. This is true though it’s only part of the story as Kara learns after Amadei is attacked. It doesn’t take long for her to discover that Amadei has a daughter named Elizabeth (Shannon Chan-Kent) that he never knew and a former lover who resents him (Michelle Krusiec). The underlying theme message is that it’s dangerous to jump to conclusions though it shouldn’t have to be a lesson that Kara learns twice in the episode. Early on she’s all for believing that Amadei is a flawless paragon of virtue though has her faith in him shaken when she discovers that he has a secret daughter. Later in the episode she finds out that it was Elizabeth’s mother who kept them apart rather than Amadei being a deadbeat Dad as she had been led to believe. It’s not hard to see that coming given that the prevailing image on his mind as he lies in a coma is that of his daughter. I have no problem with this plot on a conceptual level as it’s theoretically interesting to peel back the layers of public figures to get to the truth of who they are. The problem is how easy it all comes out. Once Kara does the bare minimum of research after having her initial impression shaken she finds that Amadei used to give frequent interviews and was pictured with Elizabeth’s mother many times. This suggests that Kara is really bad at her job as she went into an interview situation with someone who hadn’t spoken to the press in a long time without researching it thoroughly. Didn’t she at least have a quick look to make sure she wasn’t asking redundant questions? It feels like a throwback to the more ham-fisted journalistic plots of season 2 which definitely isn’t a good thing especially after the writers have renewed their focus on exploring Kara’s double life this season. All that we get from this is a clunky message that there is more to people than they let on and that it’s not always a bad thing to hide who you really are. Considering this is a show where the lead hides who they are it’s something that’s fairly well explored by this point so showing it through the lens of another character should have more depth than it does. Amadei’s estranged relationship with Elizabeth also doesn’t work because neither of these characters have enough development to encourage any kind of investment in them. James’ return as Guardian last week actually made a lot of sense in the context of the anti-alien plot. The idea that his intentions were noble but led to unforeseen negative consequences is a strong one as it ties into a larger idea that the public are prone to being manipulated or misinterpreting actions that seemed clear from the point of view of the one making the decision to take that action. James now has to deal with the fallout of his actions and there’s a lot of complexity associated with it. The one saving grace is that there’s no talk of arresting him though holding him up as a Warrior for Humanity is certainly worse from his point of view. This wasn’t what he wanted people to associate Guardian with so he is understandably uncomfortable with the whole situation. Lena doesn’t really see a problem as she sees an opportunity for James to be heard by more people since supporters of the Earth First movement reading CatCo when they wouldn’t before. To her mind all press is good press which seems really naive to me especially considering her previous treatment at the hands of the media. She should know better than anyone how dangerous bad press can be so it’s really baffling to hear her say things like this especially when she attends the event with James and hears what people say about aliens and how they see Guardian’s role within that struggle. She does encourage James to use the newfound support he has to infiltrate the movement in order to understand their perspective and throw a balanced voice into the mix which is a good idea in some respects though it is once again naive as she seems to expect unreasonable people to listen to him and become more reasonable. I’m not sure if this is sloppy writing or the prelude to Lena being knocked off her ivory tower after learning a harsh lesson in reality a few episodes from now. The idea of James going undercover inside the Earth First movement has a lot of potential. In theory it allows one of the main characters to get a first hand account of the anti-alien sentiment to give the issue more depth than what we’ve seen so far. At this point it’s fine for the exploration of the issue to be more broad as it is still being set up but in order for it to become the sweeping threat that the writers clearly want it to be there has to be more nuance and having James directly engage with it could be the way to do that. Another advantage is that he will be interacting more with Ben Lockwood. Sam Witwer’s performance really brings both aspects of this character to life. As Agent Liberty he’s a sinister and calculating anarchist who knows how to play on the fears of the people to swing public opinion in the direction he wants and as Ben Lockwood he presents the appearance of a reasonable man who says what people want to hear. The unmasked Ben Lockwood side is more interesting and arguably more dangerous but the Agent Liberty identity isn’t without merit. Either way he’s every bit the leader not living up to his ideals. He uses aliens to manufacture fear and hatred where his platform is entirely focused on how aliens do that through their very presence. Ideally his self denied hypocrisy will be his undoing but for now it’s interesting to see that he doesn’t realise how far he has to go in order to manipulate public opinion. His use of Jensen to incite panic was a good idea in theory but the execution left a lot to be desired. After last week it was good to see Kara not only listen to Alex when benching her but actually realising it herself which upped the threat level because Supergirl couldn’t be involved without putting herself in mortal danger. This makes it very much an Alex problem on multiple levels as she has to deal with it without the help of Supergirl and the source of that problem is one of her former agents. The action sequences were really underwhelming in this episode. Kara’s first engagement with Jensen was designed to show her how ineffective she would be fighting against him but it’s over too quickly to establish that he’s a significant threat to her. If she had spent the rest of the episode without powers then it would have gone a long way towards heightening the tension though that is a trope that this show leans on very heavily. I also wonder if her armour from the previous episode would have been useful in this circumstance as Jensen has to touch her in order to be a threat. The climactic action sequence was better but still lacking. I really liked the idea of Kara having two minutes to save a large group of people and only being able to do this one at a time but it is abandoned almost immediately meaning that it has no way of living up to its promise. Alex is able to find a non violent solution to this issue by appealing to Jensen’s better nature. This is an example of her taking a page out of Kara’s book and trying to see the best in people after Kara had her commitment to that shaken in her own plot. Alex’s appeal to Jensen to do the right thing works and it’s a significant enough setback for Ben to be noticeably enraged. I still don’t really buy Jensen’s defection as we don’t know the character well enough to have a baseline for his values so it isn’t believable that his betrayal of the DEO is a shock but Alex’s speech about embracing the good man she knows exists within him works well and further shows Alex’s strengths as a leader. Colonel Haley (April Parker Jones) begins assessing Alex’s effectiveness as director of the DEO. At first it seems to be going fairly well as Haley supports both her methods and decisions so it appears that they will make a good team because they are on similar wavelengths. Alex’s solution is against orders because she believed that she could solve the problem without loss of life. While this works Haley makes it clear that future disobedience will not be tolerated so there is some built in tension over the question of what Alex will do if she’s given another order that she doesn’t like. Further tension comes from their differing views on J’Onn. How Alex feels about J’Onn is well documented but Haley doesn’t share the. She refers to him as an imposter which he technically is as he pretended to be Hank Henshaw for an extended period of time. Now he is open about who he is bit still wears that face. From that point of view it’s easy to see why those in authority might oppose putting him in that position but for Haley it obviously runs deeper than that. She stops short of using the racist terms like “Roach” in description of him but it’s clear it’s on the tip of her tongue further reinforcing how systemic the prejudice is. Alex and Haley clearly have different views on what the DEO should stand for and this will definitely cause friction between them. 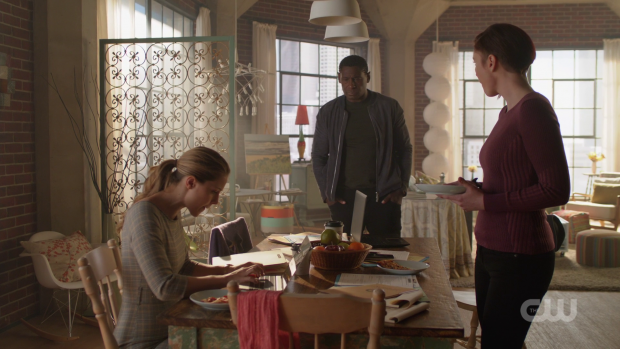 J’Onn’s quest to find a place in the world moves forward significantly in this episode when he is told that he is trusted above the police to solve alien problems. He’s one of them and tries to see both sides of an issue so people value his impartial approach and innate decency. One of my predictions last season was that J’Onn might become a private detective like his comic book counterpart and this looks to be exactly what’s happening here. It’s a perfect fit for his character and if his personal journey can tie into the larger story then it will be even more worthwhile as he can pursue his own arc while still complimenting other stories. A busy episode that does well by Alex, J’Onn, James and the ongoing prejudice narrative but struggles to deliver a coherent plot for Kara. The main problem for Kara is that her actions in this episode make it look as if she’s really bad at her job. Minimal research is enough to show her that there was more to the story than she previously thought which makes it seem as if she didn’t do the research before engaging in the interview. Kara learning that there’s often more to people than appears on the surface is a good lesson in theory but the execution left a lot to be desired. Another thing that could be problematic is Lena’s opinion that there’s no such thing as bad publicity which seems like a strange opinion considering she has been on the receiving end of a lot of it. Her view that CatCo now reaches more people because of the support Guardian is receiving as an Earth First icon makes some sense and James interacting with that group in order to learn more about them offers plenty of opportunity for added depth and conflict. Anything that provides further opportunity for any of the main characters to share scenes with Ben is very promising as Sam Witwer does a great job playing both sides of that character even if the civilian side is more interesting. Jensen makes for an underwhelming antagonist because not enough is known about him to make his betrayal of the DEO mean anything. He also participates in a couple of underwhelming action sequences that both had promise but didn’t rise to their full potential. Having it resolved non violently by Alex was a nice touch as it shows Kara’s values are infectious. Alex and Colonel Haley make for an engaging pair when it seems that they are on the same wavelength early on until she threatens Alex with consequences should she act outside her orders again even if it is to a beneficial result. Her views on J’Onn and the implication that she is against aliens in general makes for an interesting future source of conflict for them as it calls into question whether they have the same opinion on what the DEO stands for. 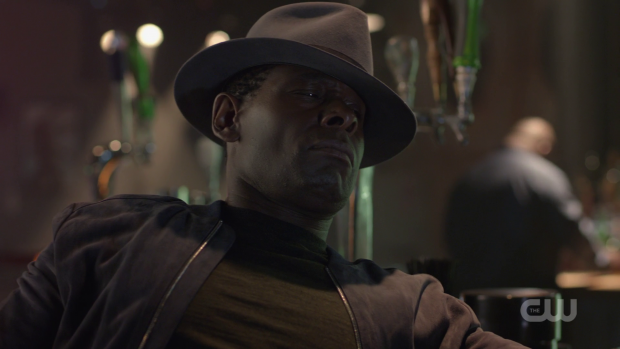 J’Onn taking another step towards finding his place in the world by being a private detective for alien issues is an excellent move for him as it suits the character wonderfully while keeping him connected to the other ongoing plots. I didn’t say that there’s not much plot when she can use all her powers, what I actually said is that having her without powers was one option to heighten the tension but that de-powering Kara was a trope the show leans on heavily though that’s all in my review. I disagree with you on the James point. For me this has been the strongest season for him in terms of what he contributes. What the writers do with him validates CatCo as a location once again and helps enhance Kara’s double life. There is a lot of Alex development yes but she’s one of the main characters and she gets to tell Kara what to do because she has training and experience where Kara has a tendency to be impulsive in certain situations though that doesn’t stop her being “super”. It just makes her flawed and interesting. Flawed and interesting I appreciate, just don’t have her powerless week after week. What would be the point of tuning in, to see if Brainy finally hooks up with someone? I think you will find yourself in the minority if you read other viewers impressions on James lackluster character. Not really the actors fault, just is put in a relationship with zero chemistry and asked to things for which he has previously shown no skill or experience (running a media conglomerate, doing triple back flips). Guess I should be content Mon El exited stage left, but really just want Supergirl to be the star of her show, and Super. 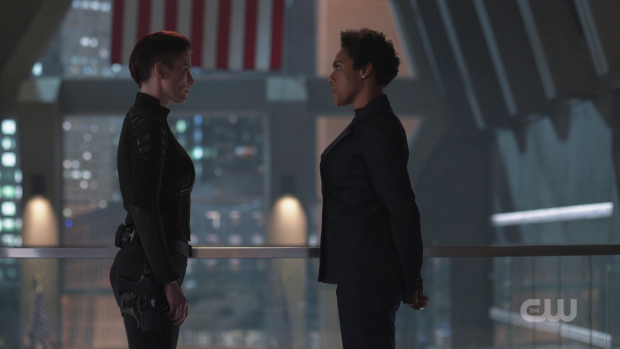 Another episodes has come of this show, The CW released the official synopsis, promotional photos and videos for Season 4 Episode 6 of Supergirl – Call to Action.